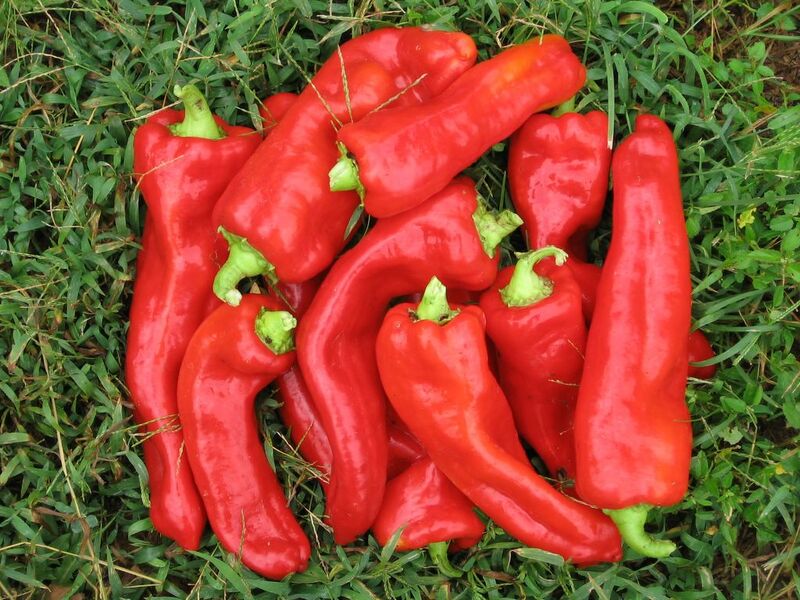 These are my favorite Aconcagua Sweet Peppers. You can see another freshly picked pile of them here and read more about them here. The pepper photos are great. I love the composition. The produce is stunning as well. Gorgeous colors! I plant my garden so that I have a variety of colors to compliment each other. My son is quite the gardener and he will say things like: "Here mom, these red peppers will look pretty next to your green chiles and yellow squash". Well, we love a pretty garden. Such a pleasure to the eye farmgirl! Wonder how these peppers would do in the mountains. Hmm; don't think so. Hafta buy them at farm markets. :-) a good excuse to go! I am so happy to have stumbled upon your blog! One of my secret dreams is to live in a farm (I'm sure you've heard that line hundreds of times hehe), your blog is the next best thing. I can live vicariously through you. :) You have the most delightful posts and pictures. Keep up the great work! I'll be coming back to visit often. Lovely peppers! I had to write you that your recipes are always a hit! I made the savory tomato pesto pie (added some canadian bacon for the men who always want to know 'where's the meat?') and everyone loved it, plus the fact that the house smelled great while it was cooking. You did it again! No wonder I've been craving tomato this and tomato that. It's all the lovely rich reds in your photographs! Ah, I do miss the garden. Our one tomato plant was obstinate due to lack of rain and water rationing this summer. There's always next year, though! I love photos in this blog ! You should attend Look and Relax blog photos, their subject is Red this month. Skye did enjoy having fresh fruits and veggies, though. Nana, fried green tomatoes are so good! I should make some, thanks for the suggestion.